Cozy, charming cottage with: two bedrooms, each with queen size bed, one bath, outdoor fireplace/grill, indoor wood stove, sandy beach, dock, screened-in porch with table and chairs, air conditioning, comfortable queen sized futon, 48 hi-def TV with cable in living area, Apple TV with 250 free movies, 32" TV in Master bedroom, free high speed internet, Blue ray and DVD players, kitchen with: fridge, toaster, coffemaker, microwave, oven and stove. Located in the friendly town of Conway just 10 minutes from North Conway, New Hampshire. Wal-mart and Shaw's are conveniently located nearby. I have both enjoyed the cottage personally and rented the property since the summer of 2003, with a constant eye on improving the vacation expereience. 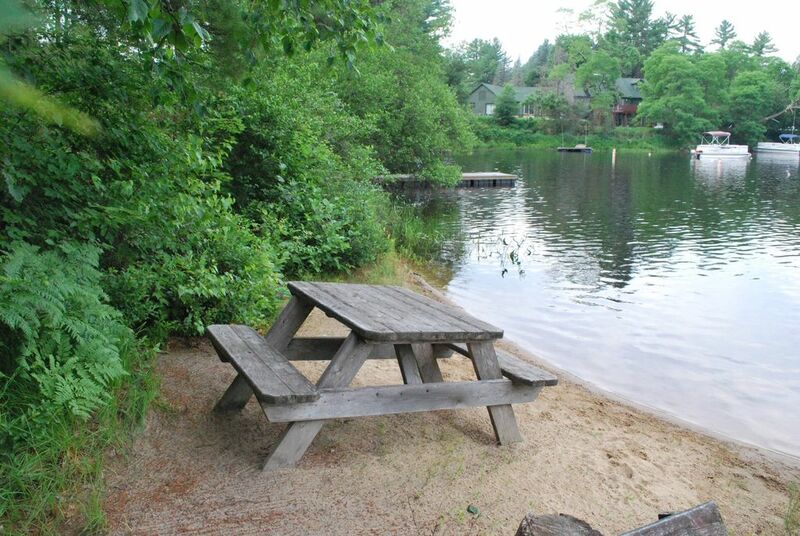 This place is rather unique as it is on a beautiful, crystal clean lake, the 1.2 acre property is shaded by towering King pine trees, it is near the mountains, the Saco River, and the national forest and yet it is still convenient to the shopping, dining and entertainment of N. Conway. Whether you are listening to the frogs chirping, watching the loons from the dock or glancing at a bald eagle, nature is never far away. Canoe and 4 kayaks available with paddles and life jackets. My and husband had stay at this cabin for a week . We enjoyed looking out at the Conway lake every day and also enjoyed the fireplace at night. The cabin had just about everything you need. Wish we would have known about this place for summer because it has a cute little screened in porch ,which we would have liked to sit out in. Ken the owner was very nice and helpful. Would definitely would stay here again. Thank you for your kind review. I am pleased that you enjoyed your stay and I hope that you return during the summer to enjoy the lake even more. Quiet, rustic, pine needles everywhere, sparkly water steps from the cabin, it was heaven!!! We had an amazing family vacation at the Wolf Den, it had everything we needed an more. The lake was beautiful and the yard was perfect for our children and dog to enjoy. Ken accommodated our needs and questions in a very timely manner, and was wonderful to work with. We would definitely like to stay at the Wolf Den in the future. Sweet cottage, what a Gem Conway Lake is. Loved the loons at night! Conway Lake is one of the cleanest lakes in the United States and most times I have kayaked on the lake, I have seen and heard the loons. It is a very special place. Everything about the property was perfect. Everything about the location was super organized and really well thought out. Every detail was covered and well thought out. Any any all communication was extremely prompt. Our stay was like being at a great hotel where you were the only guest. Property was EXCEPTIONALLY clean. Appliances were new and excellent quality and everything about the property was wonderfully quiet and VERY comfortable. We left with the appreciation that the property’s owner had put as much thought into our vacation as we had! We would recommend this to anyone and are really looking forward to booking this location again. If a six star review were possible we would have used it. I am so happy that we met and even exceeded your expectations. I am very attached to the property and it is great to know that our guests feel it is a special place as well. Thanks for taking the time to write such a wonderful review. lt had what me needed.The only problem we had was the tv kept shut off and we had to wait to turn it back on.And the AC turned on by itshelf and ny husband had to unplug it. It happen after the rain storn. So you might want to check those two things out. Conway/North Conway is a top get-away destination in summer, fall and winter. 100% refund if cancellation is made more than 30 days prior to check in. 50% refund if cancellation is made more than 14 days and less than 30 days prior to check-in. No refund if cancellation is less than 14 days prior to check in. If property can be re-rented, there will only be a $100 bookkeeping fee.